Steven S. Long has been involved in the gaming industry for nearly twenty years, during which time he's written, co-written, edited, or developed nearly 150 books. He got his start as a freelancer for Hero Games, writing Dark Champions, The Ultimate Martial Artist, Watchers Of The Dragon, and lots of other books and magazine articles. He soon branched out into working for other game companies, such as White Wolf Game Studios. 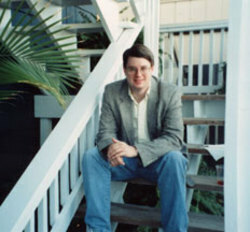 In 1997, Steve quit his job - he was a practicing trial lawyer - to try game writing and design full-time as a freelancer. Thanks to skill, determination, and luck, he soon had plenty of work. During this time he wrote for lots of companies, including White Wolf, Pinnacle Entertainment Group, and Last Unicorn Games. His work on Last Unicorn's Star Trek RPG lines earned him a full-time job with the company as Deep Space Nine RPG Line Developer. He held that job for about fifteen months, until Wizards of the Coast bought LUG. He then became a Designer for WOTC, working on (among other things) the Wheel Of Time RPG. After leaving WOTC in December 2000, Steve was hired by Decipher, Inc. to work on its new Star Trek and Lord Of The Rings RPGs. He contributed substantial portions of the two Trek core books, but spent most of 2001 writing nearly all of the LOTR RPG, for which he won his second Origins Award for Best Roleplaying Game of the year. At GenCon 2001, Steve became part of DOJ, Inc., a company that was putting together an offer to buy Hero Games. After several months of fundraising, DOJ bought the Hero Games assets in December, 2001. From then until late 2011, he worked for the company as HERO System Line Developer, making him the chief creative person at the company. During his tenure he oversaw the publication of over 100 books, most of them written by him. Some of the highlights include the Fifth Edition rulebook (2002 and 2004), the Sixth Edition rulebook (2009), Fantasy Hero (2003 and 2010), a new Dark Champions (2004), Pulp Hero (2005), and Champions Villains (2010). Currently Steve is back to freelancing and is exploring the brave new world of self-publishing. In addition to several gaming projects he's also working on Fantasy fiction. Steve, who's single and in his mid-40s, lives in scenic Greensboro, NC with his cat Osiris. He's a graduate of Duke University and Duke University School of Law (go Blue Devils!). During those rare moments when he's not doing something related to writing and game design, his hobbies include origami, calligraphy, reading, and being a young curmudgeon.